Perseus is not the only one to ride the winged horse, Pegasus. Bellerophon (Bellerophontes) is also granted the right to ride the magical steed. Though prophecies and divine intervention abound in this man’s life, he still meets a tragic end due to his careless arrogance. In Corinth before it is called Corinth, Bellerophon is born a demi god to Poseidon and Eurynome. His mother is no ordinary mortal, as Athena has tutored her to match wit and wisdom with the gods. Eurynome’s husband, Glaucus, assumes that the child is his and rears him as his own son. It is of little wonder that Bellerophon is fond of horses, both of his fathers have significant association with them. Poseidon gives humanity the first horse, and Glaucus makes his horses more vicious in battle by feeding them human flesh. From childhood Bellerophon dreams of riding the legendary Pegasus, and it becomes his first quest. The young lad makes several valiant efforts, but the winged horse always eludes him and he looks for help. The seer Polyeidus advises him to spend the night in a temple of Athena. Bellerophon dreams of the goddess giving him a golden bridle and awakens to find that she has actually given him such a gift. He immediately and appropriately makes a sacrifice to Athena and Poseidon before seeking out Pegasus. He finds the wondrous horse grazing in a meadow and is finally able to ride him. King Pittheus of Troezen was so impressed by Bellerophon’s conquest of Pegasus that he gives him his daughter’s hand in marriage. It is a happy moment for the hero, but it is only the beginning of a series of misfortunes that he cannot seem to escape. Before the wedding takes place, Bellerophon accidentally kills a man who turns out to be his brother. After he is banished, he goes to Argos to be pardoned for his crime by King Proetus. Bellerophon receives the king’s blessing, but more trouble stirs while he is enjoying the king’s hospitality. The king’s wife, Anteia, falls in love with Bellerophon. When he rebuffs her attempts to seduce him, she tells Proetus that Bellerophon has made unwanted advances toward her. This puts the king in a very awkward position. He must address the insult, but he does not want to violate the rules of hospitality. It is common knowledge that Zeus was very hostile toward those who broke the bond between host and guest. Instead of incurring the wrath of the god of gods or letting Bellerophon go unpunished, Proetus asks him to deliver a letter to his father-in-law, the king of Lycia. Since Lycia was so far away and the letter was of some urgency, he reasoned that Bellerophon could make it there in no time at all on the back of Pegasus. The message in the letter requests that the Lycian king kill Bellerophon. By the time the king gets around to reading the letter, Bellerophon has been in his company for nine days. He finds himself in the same dilemma as Proetus and decides to send the unfortunate lad on an expedition to slay the unconquerable Chimaera. This is a four-legged hybrid creature made of a lion (head in the front), a goat (head in the middle of the back), and a snake (head in the back). Since Bellerophon could attack from above, dispatching the Chimaera was a rather easy task for him. The Lycian king had no choice but to send him back to Proetus. Proetus sends Bellerophon on two more deadly expeditions with the same result. The Solymi are mighty warriors and natural enemies of Proteus’ wife’s people. 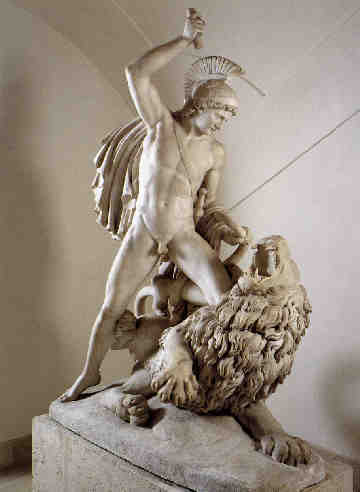 When Bellerophon conquers them he is sent to confront the Amazons, warrior women who take after their father, Ares. They, too, fall to Bellerophon. On his return trip, he is confronted by the army of the Lycian king at Proetus’ request. When they are all slain, Proetus is once again impressed. The king becomes convinced that someone who finds such favor with the gods cannot be the dishonorable house guest that his wife claims. Proetus gives Bellerophon half his kingdom and his daughter’s hand in marriage. What happens next is certain, but how it happens is unclear. It would seem that Anteia comes to her end either by her own hand because her beloved is to marry another and her lie will be revealed, ruining her, or Bellerophon takes her for a ride on Pegasus and drops her from the sky to her death. Either way the hero is set for life with a beautiful wife, quite a bit of prime real estate, the favor of the gods, and an untarnished reputation for bravery and courage. His wife bears him two strong sons and two beautiful daughters, poems are written about his deeds, and he is remembered in songs throughout Greece. As a king he is loved and respected by his subjects. No man could possibly ask for more, but evidently, this is not enough for Bellerophon. The success he has experienced over the years, as well as the accolades that come with it, have fed his arrogance and boosted his ego out of control. His confidence was necessary to defeat his adversaries, but now it has grown out of the bounds of human containment. Bellerophon forgets his place in the mortal world and determines that he is made for even greater things that what he has been given. He believes that he is invincible with Pegasus, great enough to take whatever he wants. One day he decides that he will pay the gods a visit, as they are the only ones who are his equal. It is a blasphemy that no god can tolerate. Bellerophone sets out for Mt. Olympus on the back of Pegasus, but does not make it far. Through an agent of Zeus or because the winged horse knows better, Bellerophon is thrown from his trusty steed and descends to the ground. Pegasus is welcomed in the beauteous stalls of Olympus where he is cared for with Zeus’ other horses. When Zeus needs a thunderbolt, it is Pegasus who brings him the thunder and lightning. Bellerophon survives the fall, but he is bitter about his situation. He is crippled from the fall and shunned by humanity for his disfavor with the gods. He wanders the world alone and unloved, feasting on his own soul until he finally dies.